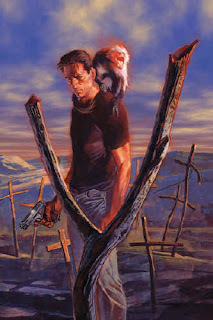 Y: The Last Man came to an end earlier this year with issue #60, concluding after a near 6 year run. The series was scribed by Brian K. Vaughan who is renowned for various comic series (notably Runaways, Ex Machina, Y:TLM) as well as writing for a handful of episodes on the TV megahit, Lost. YTLM follows the adventures of Yorick Brown, a struggling magician who one day after a mysterious global incident, is left as the only male (human or animal) alive on the planet. He is joined by his trustful helper monkey, Ampersand, a scientist, Dr. Mann, and a government agent, only known as 355. He and his friends travel around the world searching for answers as to why this incident had occured, and why he is the only man left alive. Yorick and his gang are also joined by a slew of cast and characters, some that help and others that hurt him along the way. Having read the complete series now, I found that the first half of the series was edge of your seat and gripping. The series then dragged a bit until the last 10 or so issues where it picked back up, but never to full steam like it had started with. The ending issues seemed rushed and forced, rather than fleshing it out and giving it breathing room to build. This ultimately hurt the story's mysterious denouement, however, in hindsight, it brings hope to their version of earth. The series was captivating and original (at least for a comic book series). During reading it made me think, what would I do if I were thrusted into such a situation? A few of the obvious things come to mind. I'm sure if you are a male, you're thinking the same things that I'm thinking. Such "situations" are repeatedly presented to Yorick, but thankfully for our hero (for a lack of a better word), he is noble in his intentions and almost never falls victim to his carnal desires. That said, he is still a coward in a lot of ways, which benefitted the reader. It made it easier for fellow geeks to connect to the things he does and the decisions he makes. Since the series inception, there has been talks of making this series into a movie. More recently, D.J. Caruso (Disturbia, Eagle Eye) has been attached at the helm with a Fall 2008 shooting date. I hope that the movie is successful and that they make this a franchise if only to flesh out all the stories and characters rather than forcing everything into one story arc. If you enjoy suspenceful and witty writing and want a break from superhero tales, then I suggest you check out YTLM. Until next time. Later geeks.